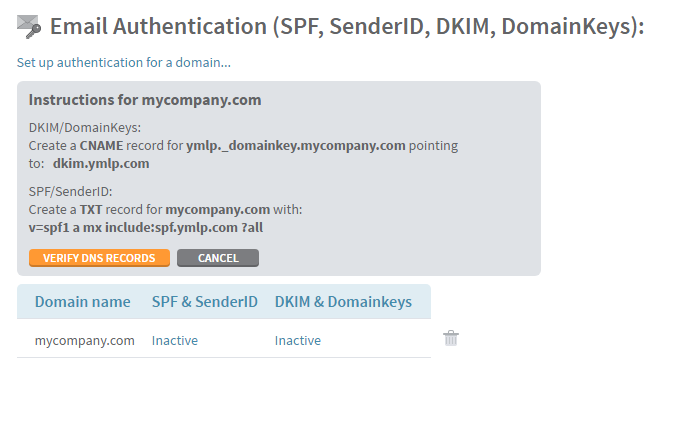 To optimize the deliverability of your email newsletters, we take care of email authentication on your behalf behind the scenes: we setup SPF, SenderID, DKIM and DomainKeys for you. This is completely transparant in most email programs; some email programs may show an additional "sent on behalf of" line in the header. It's possible to manage your own email authentication to get rid of the "sent on behalf of" line and further optimize your email deliverability. In order to use this method, you only need to add two records to the DNS settings of your domain name. Choose "Sending Newsletters" under the "Configuration" tab to manage your own email authentication.